Do you have a fresh new idea? If you’re looking to start your own business, grants are one of the ways to fund your venture. Taking the first step toward becoming an entrepreneur comes with a lot of planning and financing. If you’re looking into applying, review our list of advantages and disadvantages of business grants. The number one advantage of business grants is that they are essentially free money. Grants do not need to be repaid, which is what makes them so appealing for business endeavors. Not only that, but some grants available offer hefty amounts of money, depending on the applicant’s idea. There is a lot of information about where, how, when, and who to get grants from. This accessibility is incredibly important, because you’ll have to do a lot of searching to find the right grant for you. No matter what industry you’re getting into, there is tons of information and resources at your fingertips. Once you’ve been awarded one grant, you’re more likely to receive others. Since someone has already given you this free money, other organizations will see you as a reliable candidate. Not only will getting one grant put you on the path to receiving another, but it will also increase your visibility. Winning some of the most coveted grants can provide benefits that outweigh the simple free money advantage. Grants can also promote your business and idea, showing that your work is of notice. You’ll have to do a lot of research and fill out a lot of paperwork if you want to apply for a grant. There are many, but they are all very specific; you’ll have to find out which fits best with your venture. Once you find a grant, the proposal is the most important thing. If your idea or venture is creative, it won’t get you that grant without a convincing proposal. There are a lot of people who want the free money that grants provide. On average, around 2,700 grant proposals are submitted a day, but less than 200 will get funding. With thousands of small and online businesses out there, many of them are working to receive free money as well. Be prepared for tough competition, but don’t let that inhibit you. One of the peskier disadvantages of business grants is that they are not always renewed. Suddenly, you may no longer receive funding. You may have to reapply for grants year after year. Make sure that your business will stay steady if your grant is not renewable. Although grants are free money, they still come with plenty of restrictions and conditions. You must be very specific about how you will be using the money when you apply for a grant—once you get the money, you have to stick to that plan. State and local programs will often have a type of contingency plan set up, which means extra work for you. 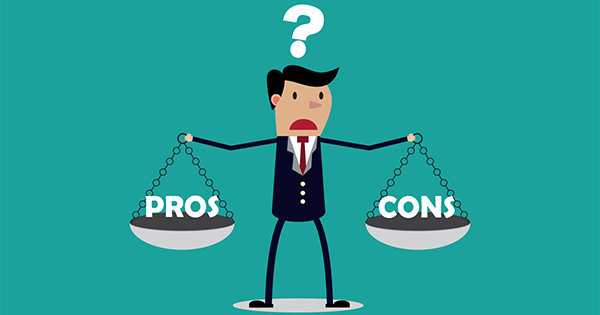 Although it may seem like a tie, in reality, the pros far outweigh the cons. The advantages and disadvantages of business grants still point to the idea of free money for your business. If you’re willing to invest time in your idea, go for it. The pros and cons of grants for business mean nothing if the belief in your idea isn’t solid.